FIREPLACE | The family’s collection of Fiesta® ware adds bright color to the island and mantel. A wall was removed to the left of the fireplace to create an opening to the breakfast room. FREE FLOWING TRAFFIC | The spacious kitchen was designed for entertaining with a large island, generous sink and sizable appliances. A doorway was cut into the wall to the right of the range so traffic can flow freely to and from the family room. 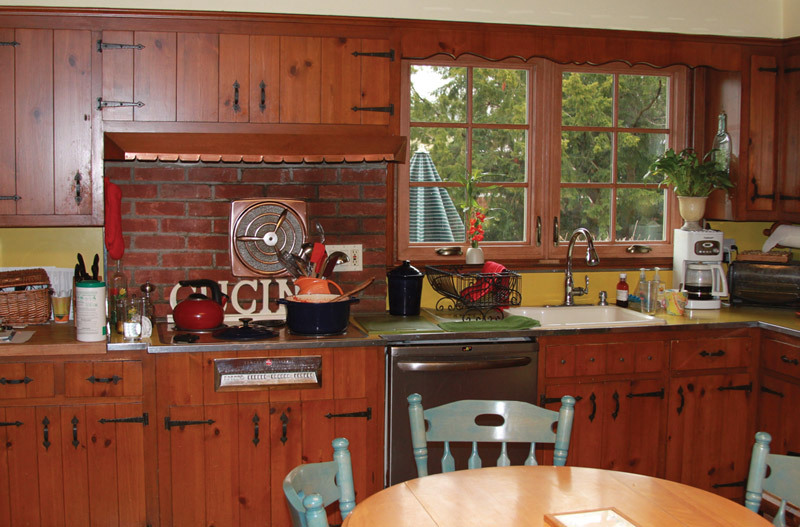 BEFORE | The original kitchen featured classic knotty pine cabinetry. 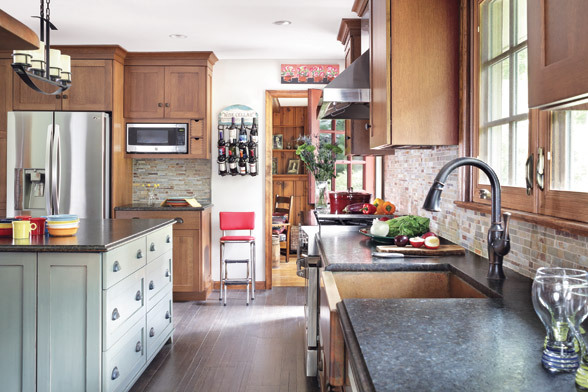 A Maywood, NJ kitchen gets a new look while keeping its coziness. 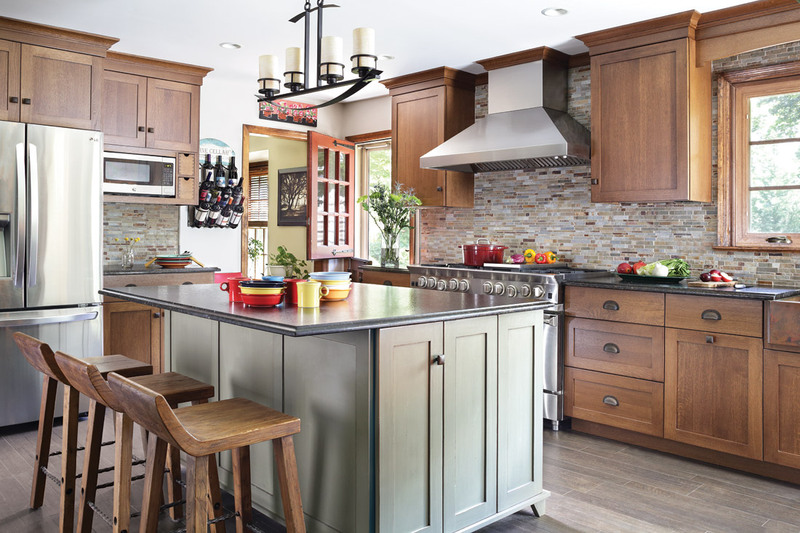 Though it was definitely time for a renovation, Eric and Kristine Koenig wanted their new kitchen to retain all the best qualities of their old one. The previous space featured classic 1950s knotty pine cabinetry with brick accents and a fireplace, all of which gave it a very homey feel. The Koenigs wanted their new space to have all that warmth, while conveying a more contemporary attitude. The Koenig residence “is a very lovely traditional home with lots of woodwork,” says designer Sharon Sherman, a state-certified interior designer, member of the American Society of Interior Designers, Certified Kitchen Designer and owner of Thyme & Place Design in Wyckoff, New Jersey. Woodworking is a hobby for Eric, and both husband and wife “really appreciate the quality of wood species and finishes.” The Koenigs also “love the simple and classic lines in Shaker-style cabinets, but they wanted something a little different.” Sherman furnished the space with two types of cabinetry—stained oak for the perimeter and maple with a soft green finish for the island. The island provides a subtle contrast to the other cabinetry and, with its footed base, looks like a piece of furniture. A hammered copper farm sink is an ideal counterpart to the Shaker cabinets, and it subtly coordinates with the color of the bricks. “We repeated the feel of the copper in the cabinet hardware with a patinated finish on the pulls,” Sherman says. 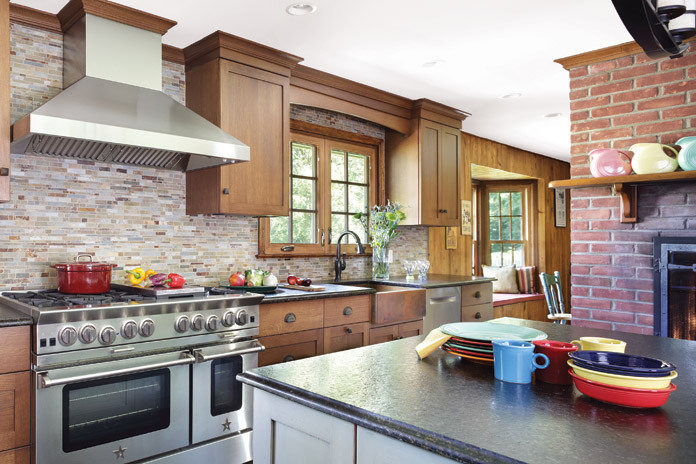 The slate backsplash, featuring tiles with varied colors and sizes, adds interest against the simpler elements in the space. The designer and the homeowners selected dark wood flooring as a foundation for the room. Design, Thyme & Place Design in Wyckoff; builder, Veenstra & Sons in North Haledon; cabinetry and cabinet hardware, through Thyme & Place Design; leathered countertop in “Labrador Green,” Stone Surfaces Inc. in East Rutherford; light over island, Visual Comfort in Houston; appliances, Karl’s Appliance in Fairfield; range hood, Rangecraft in Fairlawn; hammered copper sink, Rachiele in Apopka, Florida; backsplash tile, Wayne Tile Co.